← Will Bill Clinton stay Vegan? Here’s a little inspiration to start your week out right. 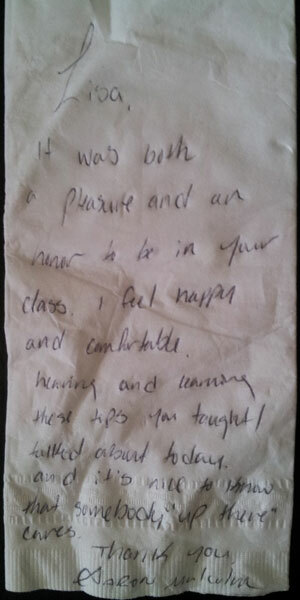 Last Monday, I received a napkin note left to Lisa Grosch, the Regional Trainer with Senior Village Management (SVM), a Kind Dining® licensed senior living community in Midland Michigan. It was both a pleasure and an honor to be in your class! I feel happy and comfortable hearing these tips you taught/talked about today and its nice to know that “somebody up there” cares. Kind Dining® classes are designed to bring out the best in people by teaching staff to get along better, respect residents and guests more, and work harder for the company that hired them. This student’s message of thanks speaks to all those elements. Knowing management cares is at the top of the satisfaction list for employees working in senior housing. Kind Dining® is a way for the, often invisible, corporate office to give back, educating, training, and preparing employees to thrive in a fast changing marketplace. To learn more, please contact us. Congratulations to the team at Senior Village Management. You are connecting with each other in a special way.